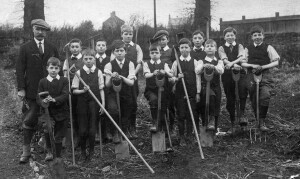 Shipton School gardening class around 1910. The elderly man is Mr Strong the headmaster. The tree is in the kindling pile, the tinsel is back in the bag and the indigestion is settling down, but it was fun while it lasted. It is definitely back to real life in February. While daylight is starting to increase, it is a bit too slowly for me. I am always tempted to start sowing too early but I must try and resist – previous failures say “wait.” According to the Met Office, spring is sprung at the beginning of March but even that can be too early for sowing, other than with protection. Also, it is not too late to prune apple and pear trees and soft fruits such as blackcurrants and gooseberries if you did not get around to it earlier. As the soil dries, you can get on with ground preparation. On that topic, we had an inspirational talk last September all about no-dig techniques. A very convincing argument was made about the importance of soil structure and the myriad of microscopic creatures and fungi that are vital for its good health. Most of this vital source of fertility is in the top eight inches of the soil and digging or deep cultivation disrupts both the structure and the microbial life in it. It seems so obvious when it is explained well. The other problem with digging is that it releases carbon into the atmosphere and we all know what that does. I am sure there are many sceptics but I note (via Countryfile) that even farmers have recognised the need to minimise their tilling of the land. Anyway, we are convinced so Linda and I are trying to reduce the amount of digging we do to the minimum. Those that know me know I am no purist and I think a total no-dig approach is probably beyond us at the moment but we will try and implement it in spirit if not fully. So, in answer to my question in the title, we will be digging but only a little bit. I shall let you know how we get on. Our season of talks is now well underway and coming up on 27 February, Andrew Tolman’s talk is entitled Off the Beaten Track and should set us up for the summer months by suggesting places to visit. This is followed on 27 March by Rosy Hardy, from Hardy’s Plants, who is talking on Early Spring Flowering Perennials. All our meetings are in Milton village hall and start at 19:30 and all are welcome. If that does not set us fair for 2019 I do not know what will.